Felix Baumgartner has become the first skydiver to go faster than the speed of sound, reaching a maximum velocity of 833.9 mph (1,342 km/h). In jumping out of a balloon 128,100 ft (24 miles; 39 km) above New Mexico, Felix Baumgartner, 43, also smashed the record for the highest ever freefall. Felix Baumgartner said he almost aborted the dive because his helmet visor fogged up. Once down, he fell to his knees and raised his fists in triumph. Helicopter recovery teams were on hand moments later. “Let me tell you – when I was standing there on top of the world, you become so humble. You don’t think about breaking records anymore, you don’t think about gaining scientific data – the only thing that you want is to come back alive,” Felix Baumgartner said afterwards at a media conference. None of the new marks set by Felix Baumgartner can be classed as “official” until endorsed by the Federation Aeronautique Internationale (FAI). Its representative was the first to greet the skydiver on the ground. GPS data recorded on to a microcard in Felix Baumgartner’s chest pack will form the basis for the height and speed claims that are made. These will be submitted formally through the Aerosport Club of Austria for certification. 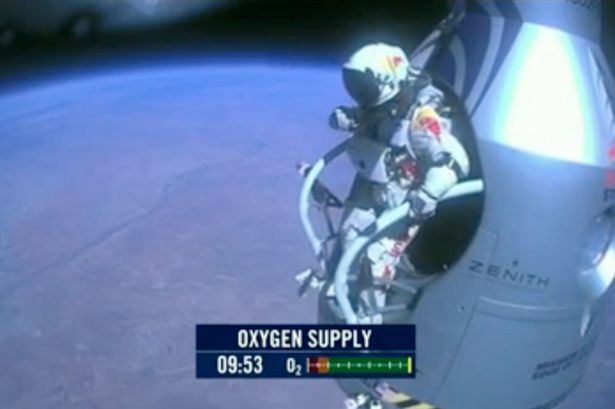 There was concern early in the dive that Felix Baumgartner was in trouble. He was supposed to get himself into a delta position – head down, arms swept back – as soon as possible after leaving his capsule. But the video showed him tumbling over and over. Eventually, however, the Austrian was able to use his great experience, from more than 2,500 career dives, to correct his fall and get into a stable configuration. Even before this drama, it was thought the mission might have to be called off. As he went through last-minute checks inside the capsule, it was found that a heater for his visor was not working. This meant the visor fogged up as he exhaled. “This is very serious, Joe,” he told retired US Air Force Col. Joe Kittinger, whose records he was attempting to break, and who was acting as his radio link in mission control at Roswell airport. The team took a calculated risk to proceed after understanding why the problem existed. Felix Baumgartner’s efforts have finally toppled records that have stood for more than 50 years. Joe Kittinger set his marks for the highest, farthest, and longest freefall when he leapt from a helium envelope in 1960. His altitude was 102,800 ft (31 km). (His record for the longest freefall remains intact – Joe Kittinger fell for more than four and a half minutes before deploying his chute; Felix Baumgartner was in freefall for four minutes and 20 seconds). Joe Kittinger, now an octogenarian, has been an integral part of Felix Baumgartner’s team, and has provided the Austrian with advice and encouragement whenever the younger man has doubted his ability to complete such a daring venture. “Felix did a great job and it was a great honor to work with this brave guy,” the elder man said. The 43-year-old adventurer – best known for leaping off skyscrapers – first discussed seriously the possibility of beating Joe Kittinger’s records in 2005. Since then, Felix Baumgartner has had to battle technical and budgetary challenges to make it happen. What he was proposing was extremely dangerous, even for a man used to those skyscraper stunts. At Sunday’s jump altitude, the air pressure is less than 2% of what it is at sea level, and it is impossible to breathe without an oxygen supply. Others who have tried to break the records have lost their lives in the process. Felix Baumgartner’s team built him a special pressurized capsule to protect him on the way up, and for his descent he wore a next generation, full pressure suit made by the same company that prepares the flight suits of astronauts. Although the jump had the appearance of another Felix Baumgartner stunt, his team stressed its high scientific relevance. “Part of this programme was to show high-altitude egress, passing through Mach and a successful re-entry back [to subsonic speed], because our belief scientifically is that’s going to benefit future private space programmes or high-altitude pilots; and Felix proved that today,” said Art Thompson, the team principal.